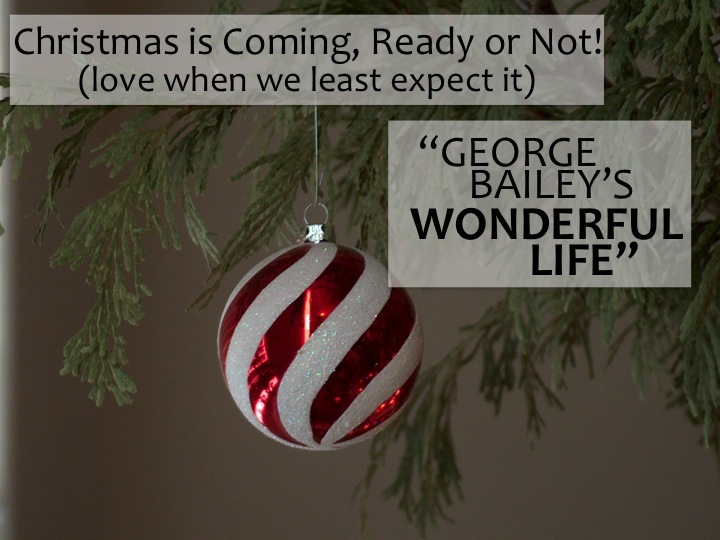 Sermon: Christmas is Coming, George Bailey! As I reference in my sermon, this week a student at Montpelier High school ended his life, and I pray these words and others like them remind us to respond in love and care. And as always if you are in a place where hope seems gone, or if you suspect a friend might be in such a place, say something. It’s hard and scary, but you don’t need to be afraid or ashamed. People will listen. The Advent series this year is a look at how God breaks into our lives when we least expect it and whether we’re ready or not. We’ll look at seasonal grumps who find transformation breaking into their lives: The Grinch, who experiences love; Ebenezer Scrooge, who moves toward justice; George Bailey, who rediscovers hope, and a Mystery Grump, in need of some Christmas joy. 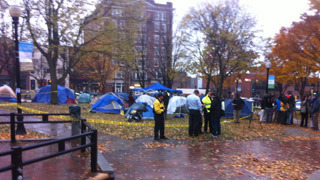 Yesterday afternoon, a 35-year-old veteran died from a self-inflicted gunshot wound in the middle of the Occupy Burlington encampment in City Park (read/view the stories from the local news and the AP). While many have been quick to rush to judgements and political statements about the occupy movement, my colleague Mark reminds us not to demonize and to instead journey together, and lifts some powerful statistics and questions to ponder. I’ve never been accused of being overly patriotic or wrapping myself in the flag. My position as a pacifist has in fact drawn criticism that I “don’t support troops” or am unpatriotic. The fact of the matter is that I don’t support wars, in part (albeit a small part in comparison to my overall objection to war because the purpose is to kill people) because we don’t take care of the people who fight in them. Both of my grandfathers were World War II veterans, and neither of them was known to talk about his experience. And that was a different war, in a different world in many ways. Veterans of Korea, Vietnam, Desert Storm, and Iraq and Afghanistan (the latter being where this individual had been deployed) find a far different reception to their service both at home and wherever they are stationed: crumbling hospitals and underfunded services, insufficient de-programming time and follow up mental health care, physical and mental illnesses that are often untreated or undiagnosed. Our veterans make up a significant portion of the population without housing (the shooting victim also being part of that demographic), and there is a very high rate of suicide among veterans. Today, we remember and honor our veterans. 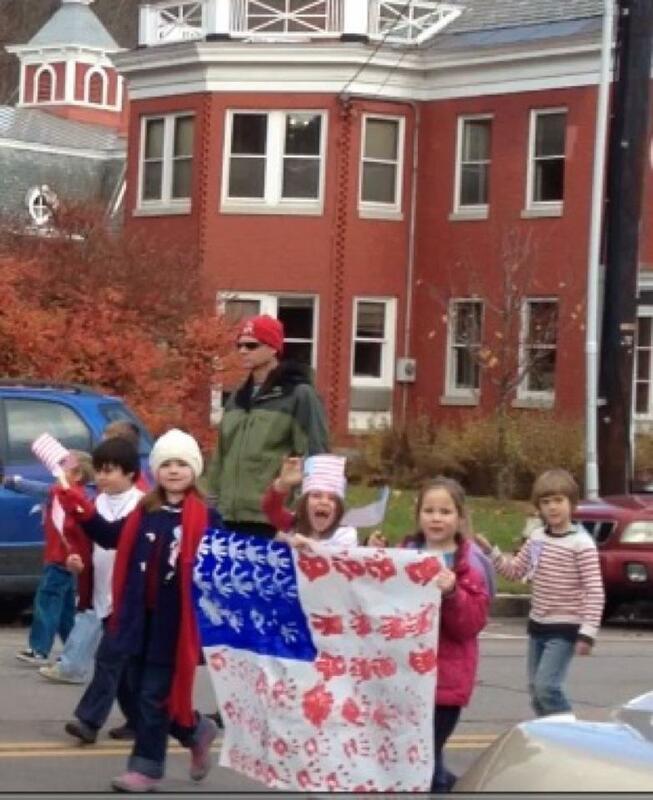 I know because I sent my daughter (center, waving) to school in red, white, and blue so she could be in the town’s parade. But I feel that we have utterly failed to honor or remember our veterans, when so many are without housing, without mental health services, without support and care in the community, without jobs, without security, when one appears to have taken his own life in the midst of a conversation about the haves and the have nots, and he is only one of thousands of veterans who will fall victim to–let alone contemplate– this tragedy this year. And so, prayers. Prayers of brokenness and confession and feeling we have failed one another. 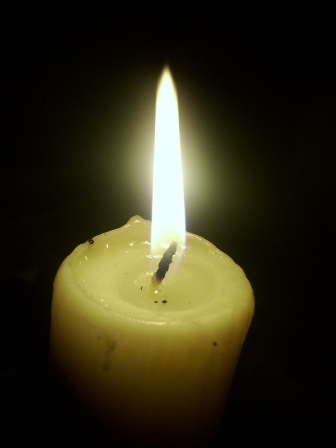 Prayers for healing and hope and justice. Prayers for the victim and his family and his community. Prayers for our veterans– the ones we celebrate and the ones we fail. Prayers for us all, with repentance, with thanksgiving, with hope. This sermon, “Words Matter,” was preached in observation of Children’s Sabbath on 10/10/10 by the Reverend Bri Desotell, United Methodist pastor in Oscoda, Michigan. It is reprinted here with permission. This is not the sermon I intended to preach today. where Paul writes about denying Christ, and Christ denying us, but even if we are faithless, Christ remains faithful, because he cannot deny himself. And we were going to talk about how Paul was encouraging Timothy and the Christians to hold on to their faith in the midst of trials and suffering, to do their best to stand up for Christ, and to trust that, even when they failed, God’s grace was enough to cover them. And it would have been a perfectly fine sermon. But it’s not the sermon we need to hear today. We are going to talk about how hard it is to have faith in the midst of trials and suffering… and we are going to talk about just how important it is for Christians to stand up for the gospel, even if it means being uncomfortable, or being ridiculed, or worse. And we are going to talk about God’s grace. But this weekend is the Children’s Sabbath – a time for people of faith, from all faiths, to consider the reality that faces our young people today – and to recommit ourselves to making sure that all children know the love and the grace of our God. And so today we are going to talk about something very specific, an epidemic that has been striking our young people at an alarming rate. And it’s not going to be an easy conversation. But it is one that is, I think, long overdue. When our churches heard about malaria – a preventable killer – we acted, sending nets and educating people to help them survive. When our churches heard about those who live in real hunger – another preventable killer – we acted, sending animals, food, and education to help our brothers and sisters survive. And it is in that spirit that I bring before you another preventable killer today, one that has robbed us of far too many promising young lives already, and it is: bullying. Now I can hear some of you thinking, “Really? Bullying?” Like me you probably grew up and were taught, “Sticks and stones may break my bones, but names will never hurt me.” But I want to tell you today: it’s not true. I’ve broken bones before. And I’ve been teased, mocked, bullied. And I can tell you firsthand, the wounds of a broken body heal far more quickly and more cleanly than the damage words can cause. Words matter. Even in our reading from Timothy today, Paul encourages the Christians to take their words seriously: to beware the words that wound and divide – he talks elsewhere in this chapter about the power of the wrong words to bring ruins, to spread like a gangrene, destroying faith – and Paul encourages them instead to use their words to speak truth and to bear witness to God. if we do it, our children will learn that it’s okay. Every time we reduce the President to a caricature – forgetting that he is also a man, a husband, a father, a Christian, someone just like us, trying to do the best we can – when we use him instead as an easy target, and laugh – our kids will learn that it’s okay to reduce other people to punchlines, so long as the joke is funny. Every time we sit in our councils and committees and shoot down new ideas just because they are raised by new voices, our kids will learn that it’s okay to fear change and close our minds to new ideas. Every time we look away from someone who is lonely, hurting, maybe a little odd – well, our kids learn it’s okay to look the other way. And every time we see words being used as weapons, and we say nothing – our young people learn from us that that’s okay, too. Words matter. Words have weight, they can wound, they can divide, destroy, and even bring death. Bullying is evil, because it strips another person of his or her worth and dignity, reducing them to a punchline, replacing a name with a label. Bullying is evil, because it preys on the easy targets, the weak and the powerless – exactly those people Jesus told us to seek out in his name. And bullying is evil, because it takes lives. In just one high school in Ohio, bullying has taken four lives in the last two years. So let me tell you about sixteen year old Sladjana, whose sister tells how – even at Sladjana’s funeral – the bullies laughed over her casket and made fun of her looks. Sladjana, whose family moved to Ohio from Bosnia in hopes of a better life for their children; Sladjana, who loved to dance, whose father – in his broken English – describes her by saying, “Nonstop smile. Nonstop music.” Sladjana, who was an easy target for bullies because of her foreign family and her foreign accent and her foreign name – who was teased, called ‘Slutty Jana,” pushed down the stairs, smacked in the face, Sladjana, who received phone calls in the middle of the night telling her to go back to Croatia, that she’d be found dead in the morning, that they’d find her body after school. Sladjana, who stood up for herself for as long as she could… until she couldn’t take it any more. Her sister found her body. And her father laments, “Today, no music. No smile.” Not any more. Let me tell you about Jennifer, who took Pepto Bismol to calm her stomach every morning, and pleaded with her mother, begging to stay home. Jennifer was sixteen years old, an accomplished horsewoman, and a young woman who happened to have hearing problems and a learning disability. She was tutored to help her keep up with her classwork… and for this, she was bullied constantly. Her mom finally agreed to pull her out of the high school and try an online education program… but Jennifer never got the chance. She took some of her mother’s antidepressants, trying to feel better, and died of an overdose. Her parents believe that, had she not been bullied, Jennifer would still be alive today. Three weeks after Eric died, his close friend Meredith took her life as well. Bright, outgoing, well-liked, a volleyball player, Meredith had recently confided to close friends that she might be gay. But it isn’t easy to be 16 and not fit in – Meredith learned that first hand from Eric. Problems and home compounded with teasing at school, until she couldn’t take it anymore. Easy targets, all of them: the effeminate boy, the foreign girl, the lesbian, the slow kid. And yet not one of them deserved what they got. Each one, a beloved child of God, a life lost because he or she didn’t quite fit in. And before we absolve ourselves of responsibility, ask yourself: how often have you complained about foreigners? Mocked a heavy accent? Moaned about having to press one for English? Made fun of a gentleman whose clothes were just a little bit too put together for Oscoda? Or a woman whose clothes were a little too “butch” for your tastes? Or rolled your eyes because someone in your Sunday school class took a little too long to sound out a word? We have helped create this culture of ridicule. We have helped create this problem. and Asher and Seth, each just 13 years old. During World War II, there were Christians who were willing to risk everything – their reputations, their homes, even their own lives – in order to give shelter to and save the lives of their Jewish neighbors. They didn’t force their neighbors to confess Christ first; they didn’t hinge safety on theological debates; no, they sheltered them because it was the right thing to do. My question for us today is: can’t we – who are faced with far less risk to ourselves – can’t we do at least as much? Every suicide is a tragedy. Every life lost breaks the heart of God. Depression is a real physiological problem, and like any other disease, sometimes it’s fatal. That is not a failure of faith, any more than we should condemn the person whose heart stops beating, or whose cancer cannot be cured. We live in a broken, hurting world, in broken, hurting bodies, and sometimes things don’t work the way they should. Sometimes our knees wear out too soon. Sometimes our cells start dividing the wrong way. And sometimes the chemicals in our brains get so out of whack that we cannot cope with the world any more, and we cannot find any hope for tomorrow. So hear these words of grace: there is nothing, nothing in life, nothing in death, not even suicide, nothing that can separate us from the love of God. Our God is a loving and gracious God, even and especially to those who have come to such a dark and lightless place that they consider ending their own lives. The official position of the United Methodist Church – and of this pastor – is that God’s grace is big enough for us all. There is no sin so big, not even the sin of suicide, no sin so big that God stops loving us or God cannot forgive. I don’t know what happens in those last moments of life, nor do I dare guess what happens in those first few moments after death. But I know that God is there, and the God I know is loving, forgiving, gracious and life-giving, and I find my hope in Him. That being said, if you are there – if you find yourself in that dark night, with no hope, overcome by despair, contemplating ending your life – please, please, wait. It gets better. It really does. I can tell you firsthand, as someone who has struggled with depression, that the darkness does not last forever. There is light on the other side. And please don’t be afraid or ashamed to ask for help. There is a song that our praise band sings that says, “I would have stayed up with you all night, had I known how to save a life.” So I want to ask you all today: how many of you would be willing to stay up all night with someone who is struggling? Would you begrudge a three a.m. phone call if your presence, simply your loving presence, your friendship, your support, could save a life? If you are willing to be there, to save a life – would you raise your hand? Look around you. You are not alone. Friends, it’s time to start saving lives. It’s time to stand up for those who have had to stand alone for far too long. It is time to speak up for those who do not have a voice. It is time to reclaim the power of healing words, to speak life, to speak hope – and to raise our children to do the same. It’s not enough to teach our kids how to cope with the teasing and bullying they receive; we need to challenge them to stand up for, to stand beside, others, to take the risk of befriending or defending the outcasts, the awkward, the lonely, the scrawny, the smelly, the foreign and the strange. And we need to model it in our own lives – We need to stop laughing at another’s expense, to stand together and say: this is not okay, and we are not going to be silent any more. All that is needed for evil to triumph in the world is for good men and women to stay silent and refuse to act. We’ve been silent for too long. We have to do something. We have to act as though we truly believe that each and every person is of sacred worth. We have to be a church, a community, where each one is welcome, is treated as a person who is made in God’s image, loved so much that Christ gave his life so he or she might live. And we might have to be willing to be a little uncomfortable ourselves – but that is a small price to pay to save a life. It’s time to take our words and our action seriously. It’s time to stand up and preach the gospel – the true gospel, not the angry hate-filled gospel that makes the headlines, not the gospel of judgment and condemnation – but the gospel that says, “God so loved the world…” and God still loves today. We can make a difference. We can save a life. We can’t afford to do any less. I deal a lot in the business of death and, more importantly, its aftermath, and the ability to hopefully mourn well. We do ourselves and our loved ones a great service when we are able to honor and say goodbye to them, and process the pain and the loss in our lives at the same time. We don’t, after all, mourn as those who have no hope. I co-officiated at a funeral about a week and a half ago for a wonderful and spunky-sounding woman I never had the pleasure of meeting. In talking to her family and listening to the eulogy, she sounds like my kind of woman. More importantly, the crowd of family and friends who gathered to grieve well together and celebrate her life bear witness to the beauty of her spirit. Her husband and sons wept; there’s something powerfully freeing about men who are sensitive enough and passionate enough and comfortable enough to cry at funerals. Her friends and cousins, who were like sisters to her, shed many tears. But her loved ones also told incredible stories about her and the sort of person she was, and the laughter spread like wildfire in the room. Her ‘hookers’ (she taught rug hooking) and neighbors and cousins shared stories about her humor, her love of art and history, her ability to hide zucchini in her neighbor’s car or mailbox or porch if her crop was overlarge. Her younger son placed a well-loved Red Sox cap on top of her urn in the grave. Her neighbor left out the zucchini, but was sorely tempted. It was a wonderful tribute to this woman, who, in her sixties, was still young enough to have given many more tears of joy and of sorrow, and who will be missed by her community, including those of us who never had the chance to meet her. I think we honored her well, and I think her loved ones were able to at least begin to say goodbye in a healthy way. A friend of mine from high school, with whom I had kept contact over the years, took her own life this past Friday night in the woods behind her house. She leaves behind a devoted and devastated husband, two children ages 5 and 1, parents, sisters, nieces, nephews, dear friends, and not a single clue, hint, warning sign, note, or explanation. I can’t even begin to imagine, much less comprehend, the kind of pain she must have been experiencing, a pain that no one– not her husband, not her sisters, not her closest friends, all of whom are well aware of the warning signs of suicide– had any knowledge of. She had plans for Saturday morning, and Sunday afternoon. She never so much as hinted that she had a hangnail, let alone a tremendous pain that somehow drove her to a place from which she couldn’t come back. She suffered, and none of us know how long, in her own silence, leaving us to wonder if there’s anything anyone could have said or asked or offered to give her the space she needed to say what was hurting her. Perhaps not. And how does one say goodbye in such a context? How does one grieve well? How does a community, a family, begin the process of healing when there are so many unknowns, so many questions we wish we could ask of her, or had asked of her, or could somehow still discover? How do we let go of a person who let go of herself and her hope and her joy, when we wish we could hold on to all of that for her? I’m nervous about the funeral service, which will be a Catholic Mass. Given that church’s historical stance on suicide, given the obituary’s wording that she ‘passed away suddenly after a brief illness’ (did they in fact discover a history of depression or mental illness since last I heard on Sunday afternoon? ), I worry that there is no way to grieve well, to say what we want to say, that we’re hurt by what has happened, by what she did, and by the fact that she didn’t tell someone–anyone!–about what she was feeling; that we’re a little pissed off at her that she would do this to her family and friends; that we’re so sorry for the agony she must have been in and wish we could go back and take it all away; that we want more than anything to help her five year old daughter (her son is thankfully so young he won’t remember this) somehow grasp joy and hope in her life, want to give her husband a place to rage and cry and despair so that he can begin to come through the other side; that most of all, we want to believe that whatever pain was there is gone now for her, and she is at peace in a way we always thought and hoped she was, a peace that, like the pain and grief she once knew and we must now bear, passes all understanding. Be at peace at last, M, and may we in time know peace as well. May that be our tribute to you. And also, probably (because of that), my best. This morning was supposed to be back-to-sunday school day, a time to focus on kids and sing “Jesus Loves Me” and talk about how Jesus wanted the little children to come to him. And we did that. For about fifteen minutes. And then the kids left the room and I asked my congregants to put their bulletins aside, and I gave the sermon of my life (soon to be uploaded) in the midst of the worship service of my life. I began by explaining what had happened, because some had known for nearly 24 hours and some had no idea: the grandson of one of my congregants, a young man of 24 with a long history of mental illness, fatally shot his father (my congregant’s son), a county legislator, multiple times, and then killed himself. The bodies were discovered by the wife/mother of the victims Saturday morning. Then I read scripture. Isaiah 43:1-7 and Romans 8:31-39. I read the hell out of that scripture in fact. Then I talked. I let people voice some response and nods, but no one seemed about to jump up and speak, so I continued, talking about the questions and the pain and the anger, tying in the anniversary of Katrina and 9/11 and all the people in our church facing difficulty right now, telling people it’s okay to be pissed off at God when bad things happen to good people. I told a couple of really powerful stories about bad things happening, and the miracle of forgiveness or healing or strength being the presence of god–rather than the hand of god working in the tragedy itself (we’re full up on platitudes here; sell that ‘it’s all part of god’s plan’ crap somewhere else). Then we took prayer concerns. And people shared stuff I never thought they would. There wasn’t a dry eye in the place. Then I did something I never do: I gave an altar call. I invited people in great need of prayer to come up to the altar and for others to stand with them, and I invited people who couldn’t come up to just stand or wave and others would come pray with them, and we prayed. A lot. The man who’d shared a really personal heartache came forward, and my husband and another congregant stood with him. I had a request to change the closing hymn from my planned “Amazing Grace” to “Here I Am, Lord,” which is sort of my congregation’s theme song. I also got an email that I’ll post separately, because I want to keep it forever. In the afternoon I visited first with my congregants (the mother/grandmother and the sister-in-law/aunt), and brought as much comfort as I could. One cousin said simply, “it’s just good and calming to talk to someone who isn’t crying.”After dinner, I went to talk to the immediate family, who has asked me to do the memorial service. It was the most awful thing I’ve ever had to do, to try and just be there with that family in such a horrific time, but I did it. And I nearly had to pull over and puke on the way home, that’s how much it hurt. But for the first time I am sure that I did everything exactly as I had to and was meant to and needed to and as it could have and should have been done. For the first time I am sure that I made a huge difference, if only because I wasn’t crying or spazzing out or offering empty platitudes. Just being there helped. People always say it does, but this time I actually saw it.